Faux Mink Bold™, our most versatile lash, gets a fresh twist with new colorful hues. Make a statement with a bright pop of color, or subtly complement your client's eyes. Our Faux Mink Bold color range will help maximize your artistic capabilities and your client's satisfaction. 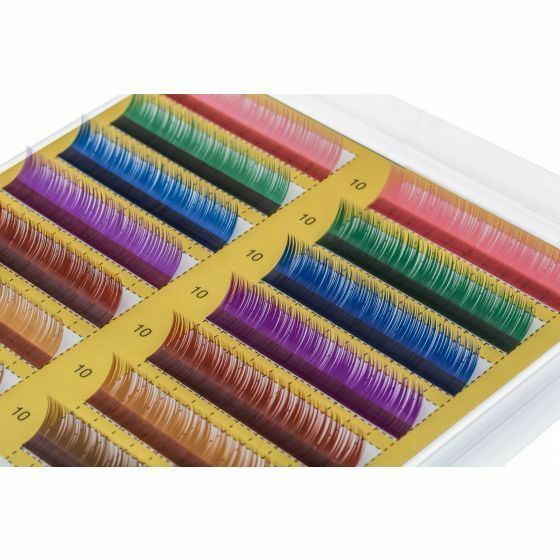 Add colored lashes to your menu for a fraction of the cost vs. purchasing individual colored lash canisters. Breeze through artistic applications with increased efficiency due to the easy to use Lash Tray packaging. Create custom looks and designs by mixing many colors together or by selecting only a few to mix. The 0.10 diameters mixed with 0.15 black eyelash extensions creates a soft, blended appearance by maintaining the overall dominant black hue. Incorporating the 0.15 diameter color lashes with black will achieve bolder, more vibrant color looks.